The Cheerz app lets you easily order prints of your Instagram, Facebook, Dropbox or Camera Roll photos, straight from the comfort of your smartphone (iOs & Android). My iPhone and I are inseparable – I do my food shopping from it, I read blogs, I keep track of James’ feeds, I catch up with the news and social media, and I’m constantly taking pictures with it. So when Cheerz got in touch with me asking if I would like to try one of their products, I immediately saw this as an opportunity to create something memorable for me to keep from my pregnancy, which I shared on my Instagram. 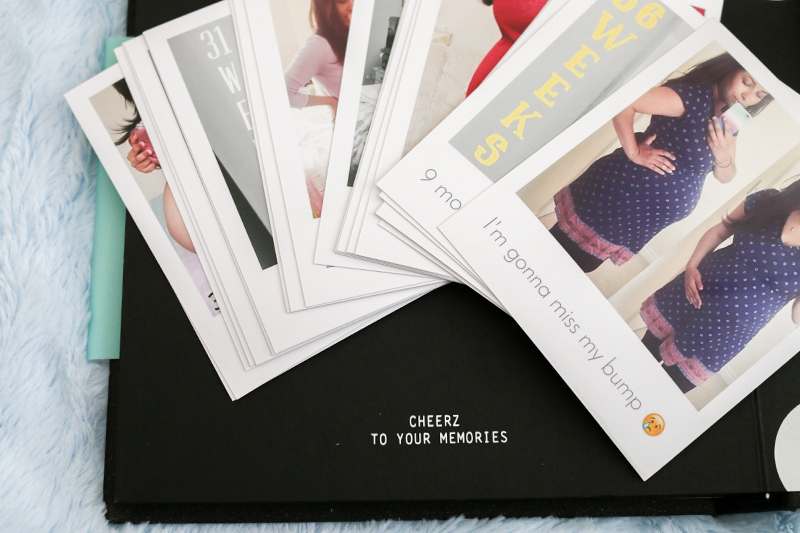 But before I tell you more about my Pregnancy Photo Book, I shall tell you a little bit about Cheerz and what it has to offer. The Cheerz app is available as a free download from the App Store or Google Play Store. You have lots of options of what to order: square prints, subtitled ones, photo strips, magnets, posters, frames, boxes, and the one I chose – the DIY Photo Book. I found the whole process easy and user-friendly; I’m quite particular with the apps I download, and unless they have an easy-to-navigate interface, they get deleted very quickly from my phone. Cheerz impressed me in that respect and I was able to oder my Photo Book one-handed, whilst breastfeeding James at the same time. Oh yes, go me! Once you choose which product you want and press the ‘Start’ button, you’re prompted to choose your photos either from your Camera Roll, Instagram, Facebook or Dropbox. I went ahead and chose 22 photos related to my pregnancy from Instagram, added a caption, a little emoji to each of them and put them in chronological order. As I briefly mentioned above, the whole ordering process couldn’t have been easier and I found myself ‘proceeding to payment’ within 20 minutes of starting to choose my photos. It didn’t take long to receive a confirmation by email, and I was able to track my parcel and order status straight from the app, which I found very convenient. The book arrived exactly one week from the day I ordered it, which is reasonable, but not overly quick. It had a small tear on the front cover, and you can see on the photos; it was a bit of a shame, but it only affects the book aesthetically. Cheerz kindly offered to reprint my book, and they told me the same would be offered to all customers, which I thought was very good customer service! I sat down with my cup of tea (and baby monitor!) and started putting together my book, reliving the memories of my pregnancy – it’s only been 3 months since James was born and I’m already getting all broody again! Anyway, back to the book. I assumed that because it comes with 22 photos, that I would have 22 pages to stick the photos, but instead, mine only had 20 pages with the self-adhesive area, which is not necessarily a problem, if it weren’t for the fact that my book tells a story, from the start of my pregnancy until the end, with the birth of my son James. Unfortunately, I realised a little bit too late that there wasn’t enough room for the last two photos, but I’m sure I can manage to incorporate the remaining photos somehow. 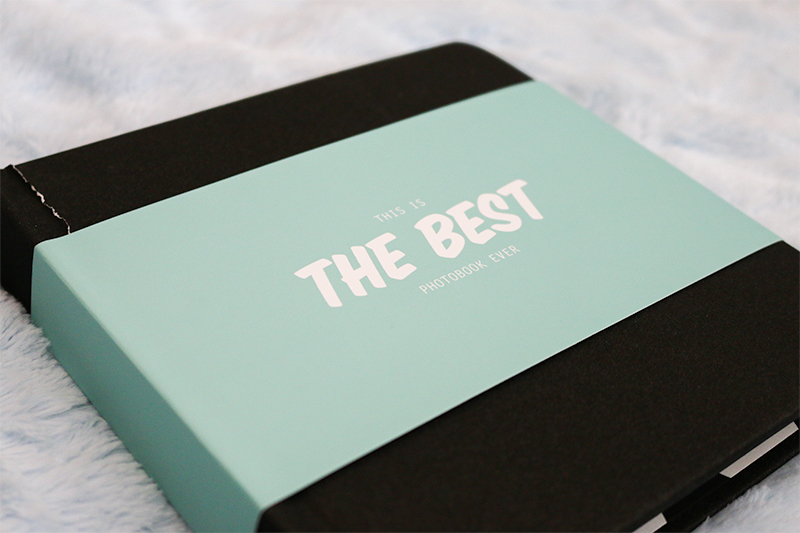 (Note: the DIY Photo Book has changed to 20 pages and 20 photos.) I’ve even improvised and put the last picture as the front cover, which wasn’t planned, but I think it looks nice. *Contains PR Samples. Read more about my Disclosure policy.